Kept captive by evil soldier Johnson (Liz May Brice), Captain Jack languishes in a cell, arms chained to the wall. We get a tantalising glimpse of our hero on the security cams, and it's full frontal Captain Jack. Some low-res screen and lettering action keep these pics from being too risque, however. 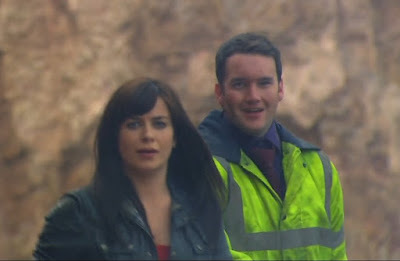 *CLICK* all Torchwood: Children of Earth pics for larger versions. Captain Jack demands to see his captor, and is surprised when she appears in a hole in the ceiling of his cell. Johnson appears, to coldly let Jack know that if she can't kill him, she can contain him. It's a terrifying scene as Captain Jack is helpless to avoid the concrete that fills his cell. Later in the episode, Jack gets up from the rubble that was once his cell. Thanks to Ianto, Gwen, and Rhys, he's free once again. Captain Jack has been through a hell of a lot this day. Gwen and Ianto are happy to see the boss's heart is still tickin'. Captain Jack's never been shy, and we love him for it. A few more of Jack and his lovely backside, making his way to the car. Hope you enjoyed the naked Captain Jack Harkness full frontal goodness. 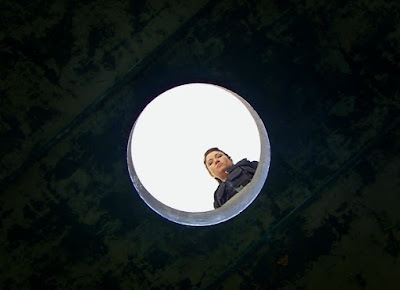 You can find more Torchwood screencaps here. Watch Torchwood: Children of Earth on BBC America this week, at 9/8c. 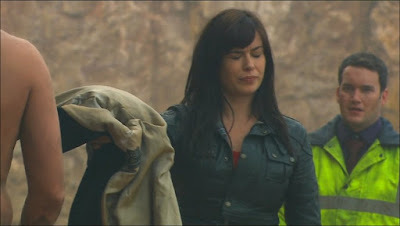 PHOTOS: John Barrowman as Captain Jack Harkness, Eve Myles as Gwen Cooper, Gareth David-Lloyd as Ianto Jones, Liz May Brice as Johnson; Torchwood: Children of Earth Day 2 screencaps, c2009 BBC Wales, BBC America.